Despite having only opened its doors in October 2014, Pacamara Boutique Coffee Roasters has quickly earned a name for itself as one of the better cafes around, receiving rave reviews from foodies and collecting a beautiful feed on Instagram geo-tag posts. Previously Oz Specialty Coffee, the café has been revamped, now with proper food instead of just desserts and drinks. 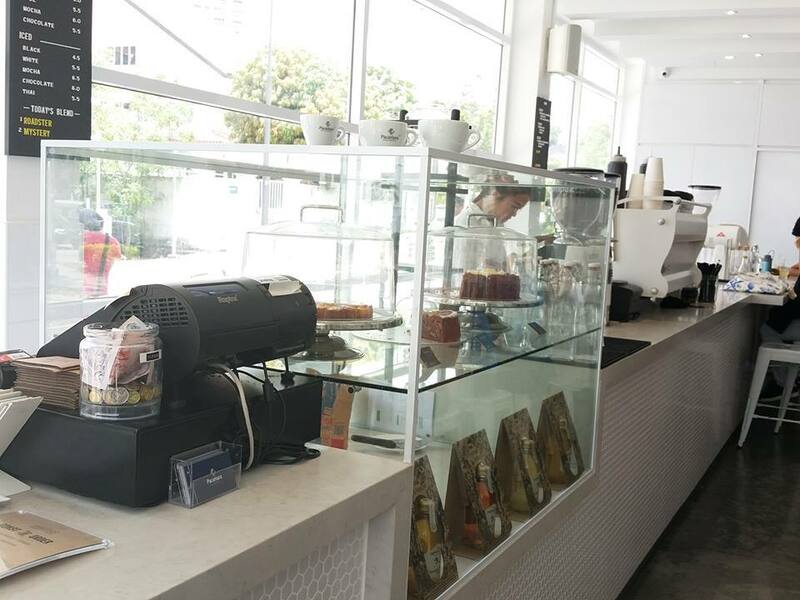 Situated only a short walk away from Raffles Institution, the all-white exterior of this cafe calls attention to it even from across the street. Immediate view of Pacamara’s counter, upon stepping in. When we entered, we were greeted by the café’s concrete flooring, clean white walls and sleek overhead lamps that came together to create a chic, minimalistic design. Large windows along the wall behind the cafe counter let in abundant natural light which, combined with the wooden furnishings, balanced out the seemingly cold and artificial interior to create a roomy, comforting atmosphere reminiscent of quaint coffee-shops. The space was also well-ventilated due to the air-con present (which was a godsend in the afternoon heat). Despite being rather crowded on weekends and lunch/dinner hours, the wait tends to be relatively short. Pacamara lives up to its name of being a boutique for coffee brewers. There was a large shelf along a wall with miscellaneous products Pacamara was selling. 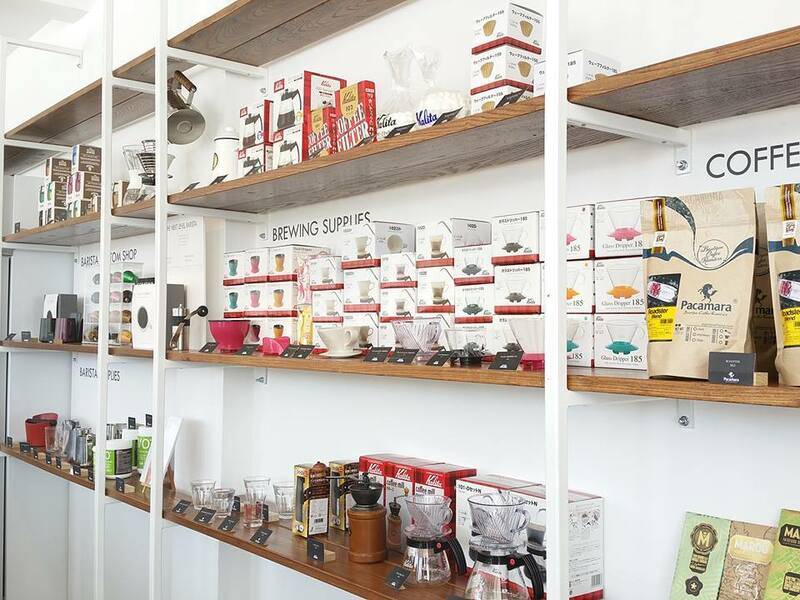 The items displayed there ranged from coffee packets and brewers to barista equipment that coffee enthusiasts could buy if they wanted to set up their own coffee business at home. The prices, in general, were hardly cheap, but were effective as decorations to the casual patron, with their vivid colours and attractive packaging designs. 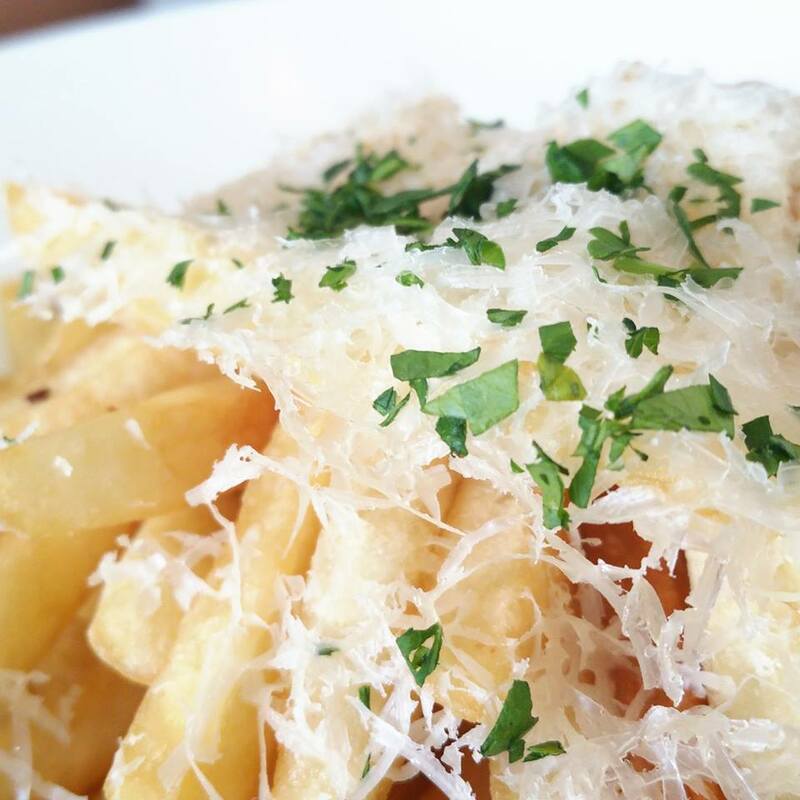 Truffle fries, up close and personal. Now, for the food: our first item was an upsized bowl of truffle fries ($12), the obligatory order for most café visits. Pacamara’s came with a nice hint of truffle oil and sprinkle of herbs that lent it an appetising aroma of fats and junk food which drew us in as soon as we received the dish. The fries were fried crisply and produced a satisfying crunch when we dug into them – it was well worth the money. 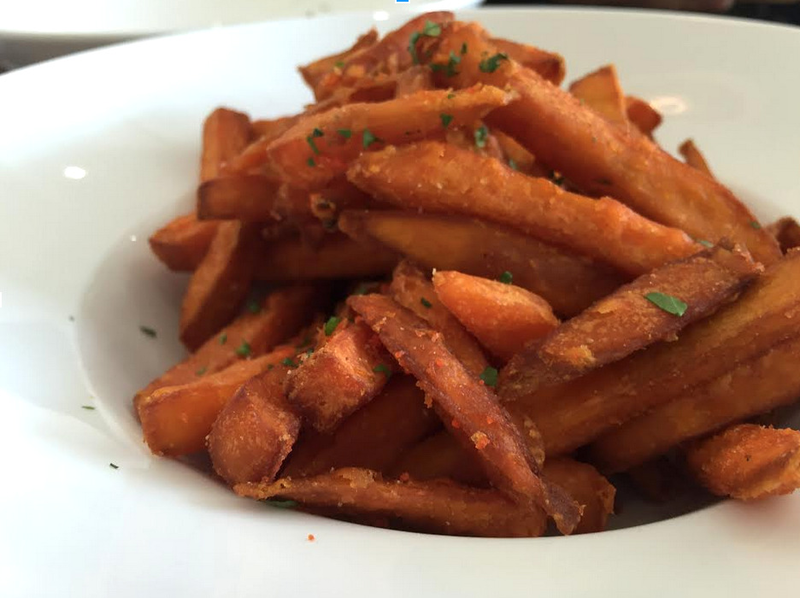 In all, the fries were a delicious and must-try dish for Pacamara’s newcomers. We split the dish among three people, but if it had been eaten by only one, it would have filled him/her up nicely. Sweet potato fries, with a presentation reminiscent of home-made treats. Next came a bowl of Sweet Potato Fries ($8), which caught our eye due to their bright orange colour, and also because they were less commonly found in typical cafés. The fries were tossed in salt and oil, complementing the sweetness of the potato well and producing a scrumptious afternoon snack. However, we found that they weren’t anything out of the ordinary, and were unlikely to become a hot favourite at Pacamara anytime soon. Pacamara: generous with their strawberries. The next victim for our appetite was the Morning Mash ($14.50). The portion, though not small, did not give the impression of being substantial, served with granola and fresh berries scattered over a shallow layer of mascarpone (Italian cream cheese). Even so, we thoroughly enjoyed the creamy and sweet goodness of the thick mascarpone. The crunchiness of the granola contrasted with the creamy texture of the cheese, making for a nice balance. 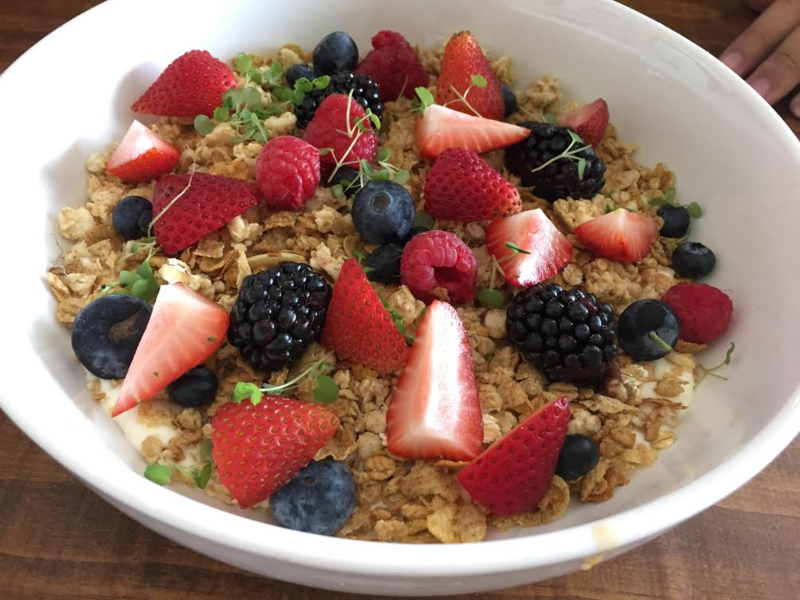 This dish was one of our favourites, as it incorporated many healthy ingredients, such as granola and berries, which came together in this wholesome and scrumptious morning dish. This item is only available in Pacamara’s daytime menu, which we felt was a pity, seeing as it was a worthy dish suitable for any health nuts seeking guilt-free options at this café. Salmon Royale fit for a royal indeed. The main course was Salmon Royale ($18). It was artfully arranged; a slice of toasted brioche (light yeast bread) topped with a generous serving of smoked salmon, two poached eggs and anchovy hollandaise sauce. 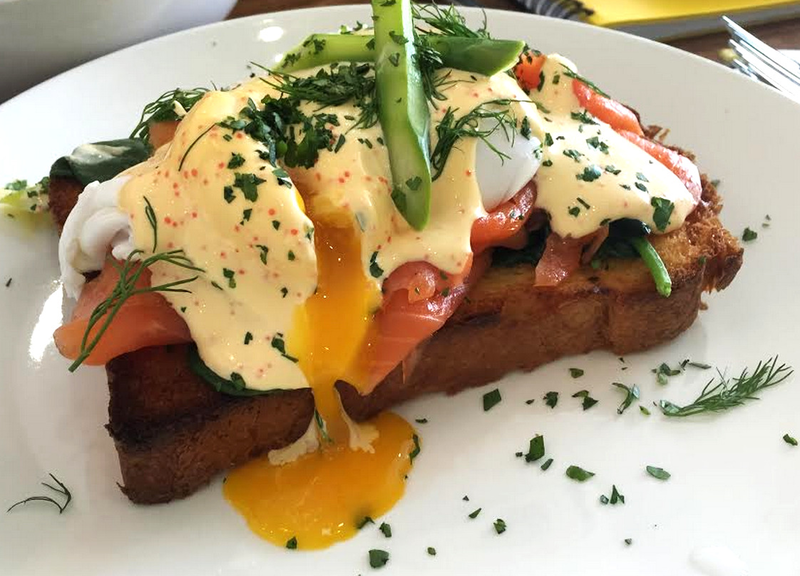 The creamy hollandaise sauce and salty smokiness of the salmon brought savoury depth to the salmon royale, but the beautifully poached eggs were definitely the highlight of the dish. It could have been more substantial, but the amount of smoked salmon made up for the priciness of this dish. In all, this was a sumptuous and enjoyable main. Next came the oven-baked 5 cheese mac & cheese ($18). Hungrygowhere boasts many glowing reviews of this particular dish that we felt we had to give it a go. 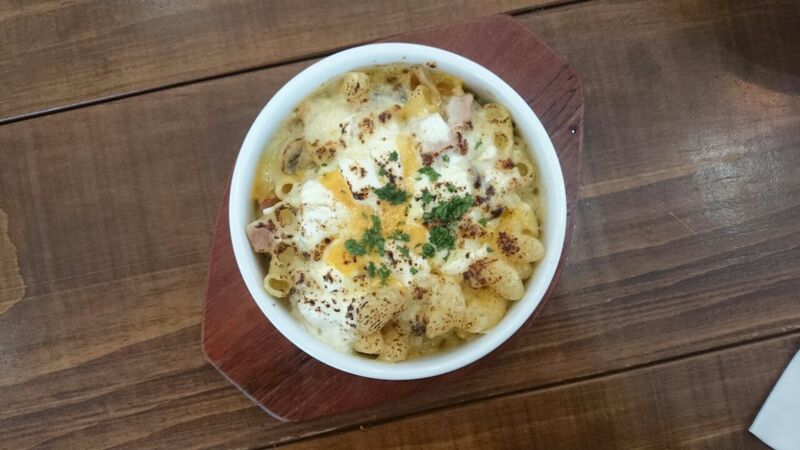 Their mac & cheese did not disappoint – with the combination of feta, parmesan, emmental, mild cheddar and mozarella, the cheese was delightfully melted without being too cloying as it tends to be at many places. Our only grouse (apart from the slightly steep price tag) would be that the cheese was not evenly distributed at the bottom of the dish, but this is nevertheless a must-try at Pacamara. 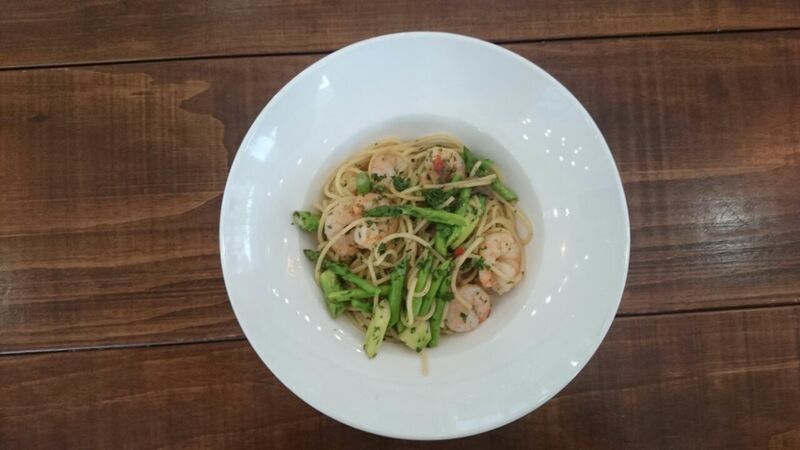 The prawn aglio olio ($18) was good comfort food, though not exceptional. If you are one of those who cannot take spicy food, avoiding this may be a good choice – there was quite a fair amount of pepper seasoning the dish. Otherwise, it was standard café fair and satisfactory enough for the less adventurous amongst us. The café provides free-flow water to its customers. Upon sitting down, we were treated to ice water elegantly served in a glass bottle that can be refilled upon request. There are also a wide variety of drinks such as tea (hot and iced), soft drinks, and craft beers available. The coffee did not disappoint, with the familiar taste of Oz Specialty carrying over. 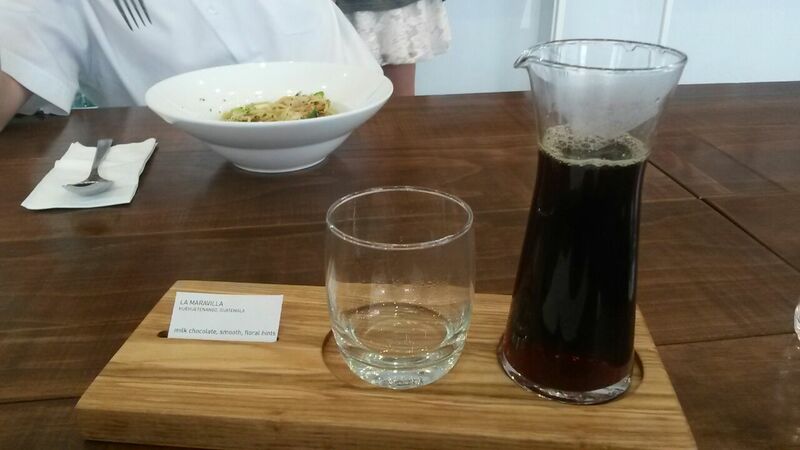 Pacamara offers filter coffee ($8), cold drip coffee, and the standard espresso-based drinks. Their filter coffee was artfully served on a wooden plate with a card describing its taste notes, with three types to choose from at any one time. The coffee changes regularly, and the acidity and aroma levels are thoughtfully provided for customers when ordering. Their filter coffees are better than most, and are guaranteed to delight both coffee experts and the layman. In addition, the iced latte ($6) (not pictured) was also impressive, with a good espresso-milk ratio that made for a good refresher on hot days with none of the blandness or excessive milkiness of Starbucks coffees we are used to. Pacamara is also famed for their latte art, and if you’re lucky, you may get a particularly impressive swan design on your coffee. We left the the café more than satisfied. Delectable fare hosted in a relaxing, nicely decorated environment had made for a pleasing dining experience throughout. On a student’s budget, a visit to Pacamara could leave you saying “I’m broke” to your friends for the rest of the week, but the well-executed menu is undoubtedly worthwhile for family outings, or as a treat for yourself.